Put simply, Fibaro is a game changer. Imagine coming home and after having turned the alarm system off the lights turn on, climate control sets to your preferred temperature, curtains open and your favourite music plays. With Fibaro home automation you can do that and more. Fibaro home automation provides each home owner with the ability to accurately monitor and control all of the smart electronic systems in the home. One of the most important benefits of home automation systems is energy efficiency. 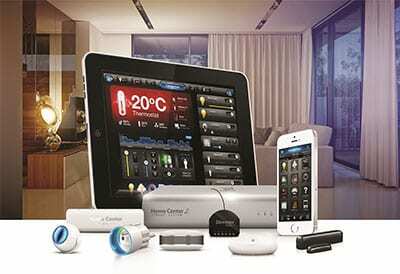 Crown’s home automation systems in Perth empower you to view how much power devices are using and when. By integrating all systems you can turn sub systems (lighting, heating, cooling, TVs etc) on or off to keep your power consumption as low as possible. You can even control and monitor devices when you’re away from the home. Fibaro can be retrofitted into existing homes or of course incorporated into the build of a new home. Learn more about Fibaro’s specific features below and watch the video to truly appreciate the power of Fibaro home auotmation. We’re an authorised dealer of Fibaro and you’re welcome to visit our showroom for further explanation on home automation in Perth and for a demonstration. Crown Security offer much more than home automation in Perth. We also offer complete home security systems including home security cameras, home alarm systems, home access control in Perth, intercom systems. Contact us today to discuss the perfect solution to suit your needs.